Some of the most controversial topics facing the world today revolve around secret societies and conspiracies tied to underground organizations. There is no question that hidden groups of people have isolated themselves from mainstream society for centuries in order to carry out executive decisions and achieve set goals. A group of people meeting in private opens itself to speculation, hearsay, and presumptions when those on the outside do not have a clue as to what's going on, especially if the actions of the organization affect the day to day lives of large numbers of non-members. Individuals held in high regard by mainstream society, and/or wield a significant amount of societal influence and power, act as magnets attracting attention to the organization. Proceedings on a daily basis may be uneventful and mundane, yet depending on the personality of the individual in question, conspiracy theorists perceive them as mischievous and conniving. Power and control manage to rest in the roots of non-member perceptions. Secret societies often rely on forms of hierarchy, symbolism, and coded messages. In fact, they're so closely intertwined with deceptive matters in order to remain secretive that they inadvertently breed ideas of conspiracy without having to lift a finger. Prieure de Sion, though, is a great example of a well known secret society who thrives on calculated information releases to the public in order to facilitate its mandate. Priory traditions date as early as 1099 CE in devotion to protecting and preserving the royal bloodline from the time of Jesus. According to inner circle members, the Priory holds information regarding evidence contradicting the Vatican's widely publicized belief of the resurrection of Christ and the story of his crucifixion. The body of evidence claims to be more valuable than gold and silver including undeniable proof by certain types of artifacts. As far the the Priory is concerned, Jesus and Mary Magdalene were married. During the time of the crucifixion Mary fled with child into hiding in France to preserve the divine bloodline. Parchments now in the Vatican's possession are said to prove the Priory's stance on the subject. In fact, it's believed certain members of the Vatican are also members of the inner circle of Prieure de Sion. They're well aware of hidden truths in Christian history but are unable to go public with the information due to complications in the positions held with the Vatican. A majority of research about the Priory starts with Berenger Sauniere, a priest from Rennes-le-Chateau in France. The story explains that in 1891 Sauniere discovered several parchments stashed inside the pillar of an aging church during renovations which eventually brought him to an unimaginable amount of wealth and knowledge. Villagers in Rennes-le-Chateau at the time testified to Sauniere's sudden increase in material possessions and could not believe how a priest became so wealthy over night. There are quite a few mixed stories from the villagers as well as theorists reflecting upon the incident. Some even believe Berenger sold off the parchments to save his church although he did give many of the families rare gifts. Inside the church is a secret door leading to an area resembling a catacomb with an additional sealed doorway preventing further access. Several people are eager to excavate the passageway and under the church, including the mayor of Rennes-le-Chateau, except the French government continues to delay or block any such permit from being granted. Despite a large number of conspiracies related to a royal bloodline, and finding the theoretical treasure of Sauniere, the fact remains that Sauniere was the real priest of Rennes-le-Chateau who did in fact run into severe money troubles and then suddenly became wealthy over night. Perhaps an old Christian treasure was discovered but instead turned over directly to the Vatican who in turn funded renovations for the church. Templar Order sought to protect the Catholic Church by any means necessary including crusades, building defense outposts, and safe guarding the wealth of the church throughout Europe. Originally known as the Poor Fellow Soldiers of Christ and the Temple of Solomon, the Knights Templar effectively altered the course of history in their involvement with the Church. Quite a few conspiracy theories point to the Knights Templar as keepers of sacred relics and knowledge from the time of Christ. Some theories even suggest the Order is responsible for hiding the Holy Grail and Ark of the Covenant away from public prying eyes throughout the ages. 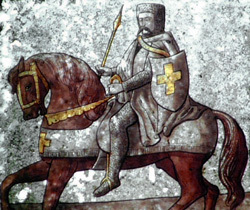 Although they are known for involvement in the crusades, many Templar were not warriors on the front-line of battle. During the rise of Templar Knights, a large amount of wealth, land, and political power was acquired by their activities. New members were required to become poor by donating any assets, and the first concept of banking (Usury) was put into practice by the Knights Templar. Banking eventually brought about the demise of Knights Templar. France's King Philip IV tried the Order for heresy, because they refused to loan him more money, having 60 members and Grand Master Jaques de Molay arrested on Friday, October 13th in 1307. In fact, some of today's superstitions about Friday the 13th evolved from this very dark day of bad luck. Pope Clement V followed suit with King Philip and ordered the arrest of thousands of Templar Knights for heresy. According to some theories, those who survived persecution went into hiding eventually to continue traditions of protecting secrets to present day. Unfortunately we do not have historical evidence corroborating the accounts of Jesus and the Romans despite the fact at least a dozen prominent historians were record-keeping during the time. The lack of this evidence is concerning to scholars who attempt to study the man said to perform amazing miracles. Perhaps the Templar Order managed to prevent an early age media frenzy by restricting publication as part of protecting the church. Or maybe, the Templar were protecting something much larger than the church was capable of handling, the weight of the universe.